where you can enjoy Macrobiotic style meals and relax. If you ever happen to be in town, make sure to visit them for a special treat! One of my favourite places in New York is the lovely SOUEN restaurant in the heart of Soho. SOUEN is a Macrobiotic heaven! The menu is packed with all the best Macrobiotic classics, Japanese style. 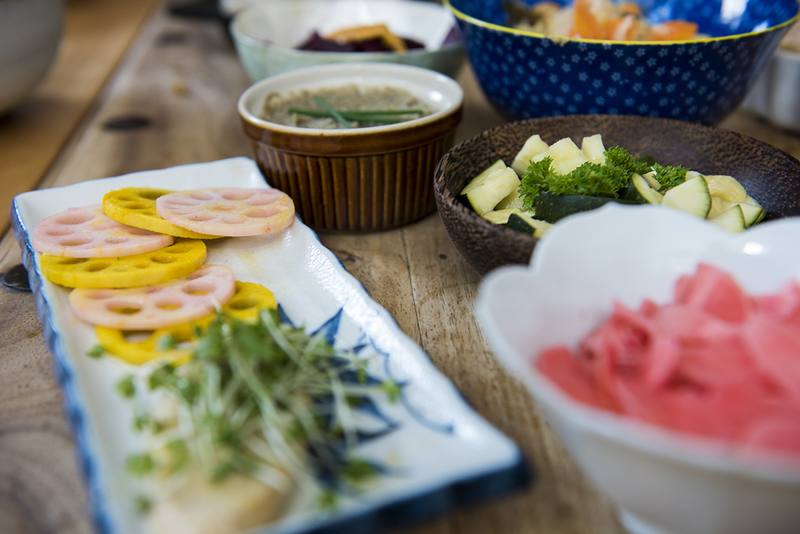 From wonderful and warming miso or kuzu soups to brown rice with pickles, seasonal vegetables, seeds and tempeh, to refreshing seaweed salads with umeboshi plums and also a nice selection of vegan ‘yummy’ desserts to try. I like the casual atmosphere and the friendly staff. SOUEN has been serving healthy food to heal and inspire since 1971. Totally a comforting must stop for all Macro lovers in town. If you love sushi and want to try something new, this unique sushi bar/restaurant offers an innovative and, surprisingly good, version of ‘the sushi experience’. Colorful rolls packed with fruits and vegetables from nearby Union Square Greenmarket are prepared with interesting and unexpected combinations. Plates include alfalfa, baked tofu, English cucumber and kiwi or spicy mix like avocado, pickled jalapeño, chayote and cilantro or exotic mix like nigiri topped with slivers of carrot, mango and snow pea. Try also a lovely selection of vegan pastries, such as black-sesame avocado cookies, sweet-potato black-bean brownies and a date-and-nut bar. Perfect place for a date or a night out to celebrate in style. This Korean vegetarian’s paradise is a full immersion in the Far East. Starting with surrendering your shoes at the entrance (make sure your socks look nice!) and continuing with testing carefully crafted lovely dishes, such thin leek, kimchi, mung bean pancakes and many more, the unique atmosphere is enchanting with a beautiful and southing Zen music in the background. Enjoy this peaceful gem and leave some space to try their tasty and deliciously-chilled desserts to complete your journey experience.